Sandra Bullock faces some weighty dilemmas in "Gravity." © 2013 Warner Bros. 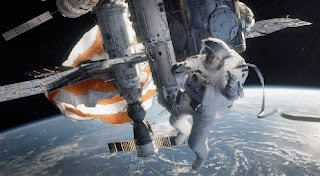 The SF thriller "Gravity" basically consists of several elaborate special effects scenes strung together by a bare-minimum plot, but this astronauts-in-peril adventure looks so good it sets a stratospheric new visual standard for the genre. Stars Sandra Bullock and George Clooney are so convincingly and acrobatically weightless as they drift from space telescope to space stations to spacecraft that watching them is a literally breathtaking experience. Director/co-writer Alfonso Cuaron ("Y Tu Mama Tambien," "Harry Potter and The Prisoner of Azkaban") keeps his camera in almost constant motion, following and circling the characters and some very realistic orbiting structures suspended high above the Earth. "Gravity" is such an impressive technical achievement that it is one of the top must-see movies of the year, if only for the "seeing" part. The dialog is its drawback, to the point that the film may have worked better with only Steven Price's dramatic and unusual score on the soundtrack instead of so much extraneous and hackneyed chatter. Clooney is smirkingly confident and constantly cool mission leader Matt Kowalsky, whose rambling "did I ever tell you about" stories are more annoying than amusing. Because he never displays a scintilla of emotion even during moments of calamitous life-threatening catastrophe, it's hard not to wonder if Kowalsky has been putting Xanax in his Tang. Bullock is first-time-in-spacer Dr. Ryan Stone, whose maudlin backstory feels more written than realistic. While Bullock does an adequate job of remaining straight-faced throughout instead of resorting to her usual comedic tics, her soapy conversations with the dead never raise the tears they clearly are intended to jerk. While installing an upgrade on the Hubble telescope, Kowalsky and company learn that debris from a detonated satellite is headed their way. The rest of the movie consists of dealing with the scrap metal equivalent of a missile storm that will be coming around every 90 minutes. In other words, we're not exactly talking about pithily philosophical "Prometheus"-level plotting here. Everything floats and crashes and blows up with you-are-there realism, and some of the untethered tumbling is so carnival-ride disorienting it may cause actual nausea. There's also a lot of unexpected beauty, from something as iconic as a sunrise seen at the curve of the Earth to the sight of a striped parachute draped over the hardware of the international space station. A misguided visual moment comes when the increasingly desperate but determined Dr. Stone does a "Barbarella"-style zero-G peel-down after entering an airlock. Bullock looks so impressively fit in a gray tank top and black bicycle shorts that her next project should be a workout video, but the scene seems even more gratuitous than Ripley's strip-to-undies bit in "Alien." Also, two scenes are marred by camera-lens spots that are as irritatingly distracting as a boom mike suddenly entering the frame and staying there. Why directors don't realize that this sort of thing takes an audience completely out of a movie by drawing attention to the tools used to make it is a real mystery. The fact that one of the spotting incidents takes place in the very last shot of the movie is downright tragic. But forget about those flubs, the skimpy storyline that could be summed up in four words and the fact that "Gravity" would have been more satisfying as a silent movie. There's not likely to be a more immersive and senses-overwhelming spectacle released this year, and sometimes the ride is the thing. As Clooney's Kowalsky puts it, "You can't beat the view."